We’d like to introduce you to one of Iowa’s newest luxury hotels – and it’s run by and for students. Students in Kirkwood Community College’s Hospitality programs prepare for careers in the field via practical experience in management and food preparation at The Hotel at Kirkwood Center, a world-class teaching hotel in Cedar Rapids. Instructors supervise students in the daily operation of the bakery and catering service. The Class Act, the facility’s restaurant, features creative gourmet dining for the public, at very reasonable prices. Students also cultivate the Vineyard, and sell the fruits of their labors at the Hotel as well. In addition to learning management techniques and food preparation, 300+ students also study technical subjects such as financial record keeping, food fundamentals, nutrition, computers, food purchasing, sanitation, equipment, human relations, and the safety and legal aspects of the hospitality industry. The newly built center is eco-friendly. Some highlights of the energy efficient features include seven pumps that freeze ice in nine “ICE KUBE” units late at night when energy rates are lowest. That trapped ice then melts the next day, cooling the classrooms, kitchens and Class Act restaurant when daytime electric rates are much higher. The Hotel uses geothermal ground-heat exchangers, with more than 200 bored wells. It brings up cool temperatures in the summer and warm temperatures in the winter to help cool and heat to the 117,000 square foot facility. A system of motion sensors detect when no one is in a classroom or other space, turning lights off when no one is in the room. Unoccupied guest rooms are put into a “dormant” mode when unoccupied. A new guest registration will automatically re-activate the room. Oh, and they use Frontier spices in their classrooms and kitchens! David Horsfield, Department Chair of the Hospitality Arts Program, recently took time out to answer some of our questions about his work and the program. His commitment to training exceptional hosts is inspiring. We’re especially appreciative of his insightful comments on working with spices. Tell us about what you do at the Hotel. My position as Department Chair of the Hospitality Programs at Kirkwood Community College involves overseeing the 5 separate hospitality programs offered at the College: 2-year Associate of Applied Science Degrees in Restaurant Management, Culinary Arts, and Hotel Management, and 1-year Diplomas in Culinary Arts (Bakery Emphasis) and Food Service Assistant. I have been teaching at the College as a Chef Instructor for 5 years, and we currently have approximately 315 students studying within our programs. Our structure is somewhat unique in that our curriculum is delivered in a blended format that includes classroom instruction, practical labs, and also practical work within the various outlets and departments that comprise the full service, 71-room Hotel at Kirkwood Center. Our Culinary students spend time working in the Class Act restaurant and in the busy banqueting kitchen. Restaurant students both serve and ultimately manage service within the restaurant dining room. 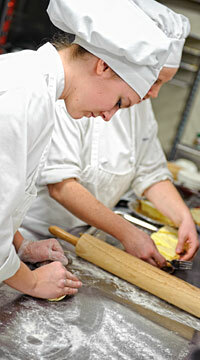 Bakery students work with the Hotel pastry chef to produce wedding and special occasion cakes. Hotel Management students spend time in housekeeping and front office. Our model embraces the best elements of using faculty and industry professionals to give students the skills and insights necessary to be successful in the hospitality industry. What are some of the main things the students learn in this environment versus a classroom? Our blended learning environment allows students to acquire knowledge and skills through a variety of class formats that include classroom instruction, practical labs, and the by working with professionals in our restaurant and hotel customer contact points. Our practical lab classes are a blended format where we deliver a detailed theory session in the kitchen before transitioning to cook dishes related to the theory we have just covered. As an example, our Indian Cuisine class, which runs for 12 hours over 3 consecutive days, begins each day with a discussion of Indian culture, ingredients, and the interplay of how different religions within India impact the processes and ingredients with which Indian dishes are prepared. This allows us to reinforce concepts through practical application. 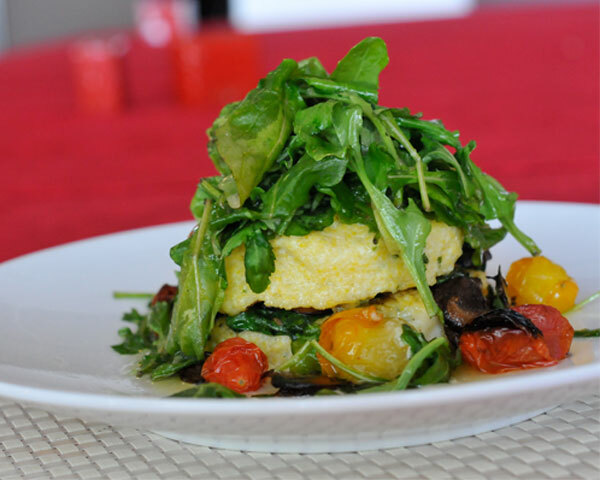 Personally, I find that food always tastes so much better when it has been prepared with a deeper understanding of how the elements within a dish join together to create the broader flavors and textures that are enjoyed by a diner. There really is no substitute for the practical learning gained from working with professional staff and directly with guests. What seems to surprise the students most about the hospitality field? A lot of our Restaurant and Culinary students begin exploring the hospitality industry as a profession with the intent of entering straight into the restaurant sector, assuming that this element is really the only option for the industry. I really enjoy exposing students to the fact that the hospitality industry encompasses so many broader options, such as working with cruise line operators, health care providers, major amusement parks, and specialty food producers. Watching students develop a greater appreciation for food, wine, & ingredient pairings is a great part of being involved in training the next generation to enter into this great industry. What are some of the ways you use our spices? We utilize Frontier herbs and spices on a daily basis both in our culinary labs and in our outlets. Our plan of study includes a 6-week intensive class on International Cuisine that encompasses exploring the ingredients, culture and flavors of so many of the world’s great spice-oriented cuisines, including Mexico, Spain, the Caribbean, Thailand, India, and Italy. Using top-quality spices in our recipes makes a world of difference when it comes to authenticating the true flavor profiles of these cuisines. Second-rate spices lead to second-rate food. Our chef instructors are big believers in the principle that respecting the balanced flavors of ingredients – especially spices – leads to the creation of memorable flavor combinations. Knowing how to correctly cook with spices takes careful thought and attention so true flavors are gently extracted for maximum benefit. The cuisine of India is one of my personal favorites as is it incorporates the subtleties of so many diverse spices. Do you have a popular recipe you’d like to share with our readers? Here’s a great-tasting vegetarian Indian dish that perhaps looks a little complex at first glance at the ingredient list, but it’s really quite simple once you’ve gathered the spices. 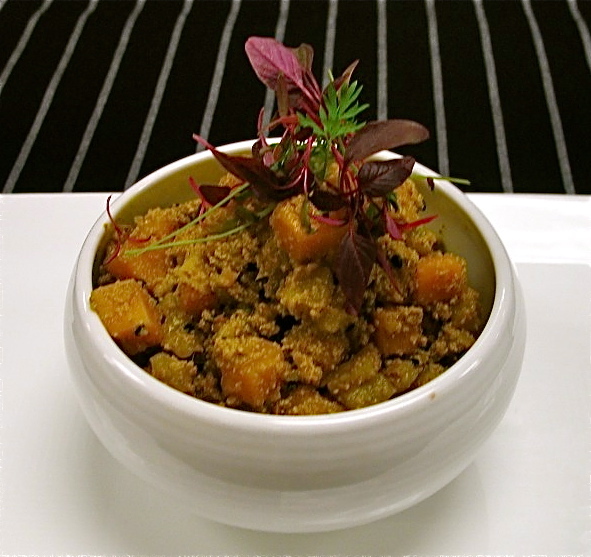 The asafoetida could be substituted with onion powder and a couple of pinches of garlic powder. Jaggery is a solidified extract of molasses that can be found at an Indian grocery, but dark brown sugar will provide a fine substitute. Soak tamarind pulp in 1/2 cup of warm water for 20 minutes or until soft – knead the pulp to break it down before straining and keeping the juice / water and discarding the remaining pulp solids. Heat ghee in a medium skillet over medium heat and when hot, add bay leaf, cumin seeds, coriander seeds, fenugreek seeds, black sesame seeds, asafoetida and sliced fennel; sauté for 2 minutes until all ingredients are very aromatic. Add the ginger and butternut squash and continue to cook, stirring, for another 2 minutes. Mix in the turmeric, dry chili and season lightly with salt. Add coriander powder and stir in yogurt; cook, covered, over low-medium heat for 15 minutes or until squash are half cooked through. Add jaggery, tamarind juice, garam masala and green chili. Cover again and cook over low heat until squash is cooked through and tender. Garnish with fresh cilantro sprigs and serve with steamed basmati rice. Do you have any advice for those who are considering entering the hospitality field? I truly believe that the key ingredient to success in the hospitality industry is passion. Really caring about exceeding the expectations of guests, whether it is in the hotel or food service sectors is the defining characteristic that makes your interaction as a hospitality professional memorable for customers. For me, passion means truly loving what you do and striving to deliver quality at every opportunity. Gaining knowledge and a thorough understanding of ingredients and the ways in which they work together is a great way for a chef to create dishes that will exceed expectations every single time. I always tell my students that cooking is a form of art and that they are training to become artists with ingredients as their medium… oh, and also that cooking should be fun! Thanks so much, David. We really appreciate the value you place on spices as a chef’s expression of individuality. For a final treat, here’s the in-room video you’ll see when you’re a guest at this unique facility. This entry was posted in In the kitchen, In the news, Natural health, Sustainability and tagged chef, Class Act restaurant, cooking, David Horsfield, food, Frontier, Hospitality Arts Program, Kirkwood Community College, organics, spices, The Hotel at Kirkwood by Cayenne Room. Bookmark the permalink.